South African singer Nomasonto Mnisi, or Mshoza. one of the most popular Kwaito artists on the scene who has whitened her skin colour. While political Apartheid ended in South Africa over 18 years ago the legacy of slavery and European colonialism has left an ugly stain of extreme low self esteem amongst South Africans, where according to a recent study by the University of Cape Town, one in three women bleach their skin. A recent BBC article titled, Africa: Where black is not really beautiful, by Pumza Fihlani, exposed an ugly side to South Africa which discredits the fight for racial equality and freedom from European colonial rule. 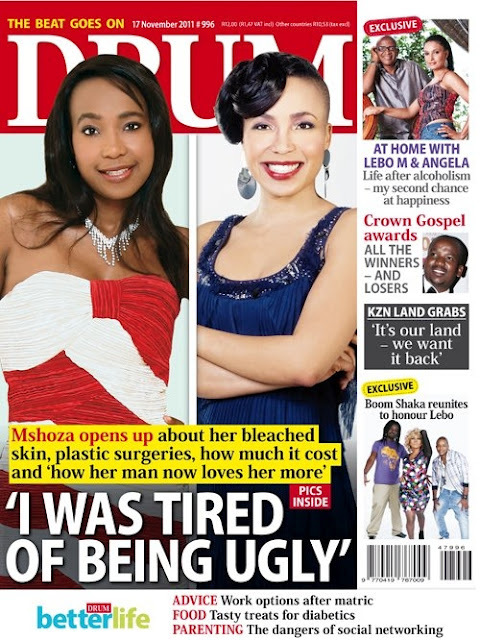 Mshoza’s view of her dark skin is shared by many Africans it seems as the World Health Organisation reported that 77% of Nigerian women use skin bleaching products regularly, followed by women from Togo 59%, South Africa, 35%, and Mali 25%. The legacy of European racism and colonialism is still deeply embedded in the minds of not just Africans, but also people of ethnic origin all over the world. In my article Chris Rock deals with black hair in new documentary I dealt with the negative connotations that black hair and indeed characteristics are associated with to the point that black people attempt to remove these characteristics through products such as skin lighteners and hair straighteners. American comedian Chris Rock found it disturbing when his five-year-old daughter Lola asked him, “Daddy, how come I don’t have good hair?” This prompted him to make the documentary “Good Hair”, which I highly recommend readers to watch. As Marsh’s article shows, skin lightening is not exclusive to Africans, Asians to are changing their appearance to look more European. In the article Fans outraged as Elle Magazine is accused of digitally lightening Bollywood star, a Mail Online report said that skin lightening products in India is now a multi million-pound industry aimed at young Indian men and women. With an African-American president leading America, the media portrays a world now free of the legacy of European colonialism, but this is far from the reality as the evidence in this article shows. If we are living in a generally racially harmonious world the need for skin bleaching would diminish, but this need is growing and points to a contradiction in race relations. No doubt young children from African and other ethnic backgrounds will learn not to be comfortable in their own skin and this cancerous self hate will be passed on from generation to generation until we all decide enough is enough and tackle these issues head-on. This entry was posted in Lifestyle & Health and tagged ethnic spending power for products promoted to lighten skin tone, one in three South African women bleach their skin, skin lightening products in India is now a multi million-pound industry. Bookmark the permalink. Interesting article. I found the following Youtube video some time ago that discusses the same problem. It is 1 hour and 15 minutes long.